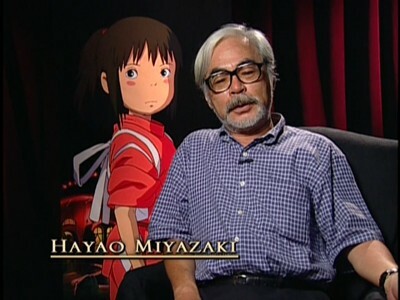 Hayao Miyazaki's wonderfully wacky and poetic mind had thoroughly explored two spectrums of the imagination before taking on Spirited Away: broad realms of fantasy filled with castles in the sky and valleys of the wind, and pragmatic use of curses and magic in the lives of coming-of-age witches and veteran fighter pilots. The true power of the director's sole Oscar-winning feature, however, rests in how he's able to weave together those two sensibilities, telling a smaller-scale story of a brokenhearted girl who's transported to and lost in another realm beyond her existence. His tale of Chihiro evokes a tremendous amount of emotional complexity and visual splendor within its premise, discovering broad whimsical scope and significant expressions of individual growth within a confined setting that's just as breathtaking as Miyazaki's sprawling fantasies. Bathed in bravura imagery that marvelously balances wittiness and peculiarity, it's a radiant piece of artistry with a strong, meaningful undercurrent that speaks to all ages, easily earning its place among the director's finest creations. Chihiro's story begins during a car ride, where the young preteen girl expresses sadness over moving away from her prior home and friends. Her parents get lost on the drive out to their new house, taking a wrong turn into the rural outskirts outside of an abandoned amusement park, to which the parents insist on exploring against Chihiro's nervous and emotional wishes. Further in, her parents discover a buffet of food at an vacant stall, proving too tempting of an invitation for them yet not enough for their addled daughter to indulge. Shortly after they start to eat, the abandoned town begins to shift in the gloominess of its atmosphere, transforming the parents into beasts as Chihiro flees from the town's fantastical transformation. Just as all hope seems lost, a kindly young stranger, Haku, offers his aid to the young girl, guiding her towards a majestic bathhouse where she might be able to hide out until they figure out what to do about her parents' transformation ... and how she'll escape the realm. While oozing boar gods and eerie spore forests created some trepidation in Miyazaki's previous works through disquieting imagery, Chihiro's entrance into the spirit world generates a degree of surreal uneasiness that's far more haunting than anything he'd made before. Grotesque animal transformations, darkening alleyways, and tubular specters underscore that the young girl has ventured beyond a point of no return, a place where her options are limited and her friends are few and far between. That feeling continues as she forces her way into working at the bathhouse -- assumedly Chihiro's first real job -- as she scrubs floors and preps tubs for unfathomably powerful gods, all while staying away from the scornful gaze of the sorceress and establishment owner, Yubaba, in a realm where consuming and exploiting humans isn't off-limits. Miyazaki makes this situation seem hazardous in profound ways, where it's unclear what'll happen to the girl as she interacts with all manner of ethereal, visually warped beings. Watching how Chihiro copes with her dilemma, both her triumphs and her emotional breakdowns, becomes an exceptionally rewarding and oftentimes tense experience in Spirited Away. 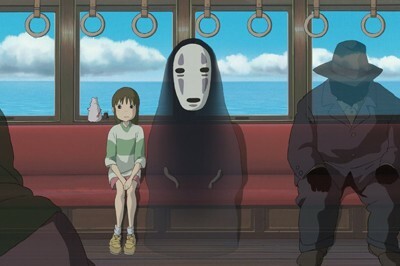 In the halls of the immaculately-detailed bathhouse, which brings whimsical beings together with a mysterious but grounded atmosphere reminiscent of an establishment from Miyazaki's past, Chihiro is forced to grow up rather quickly from the dramatically despondent kid she was while riding in the backseat to her new home. In that, the fear embedded in the setting becomes a surreptitious metaphor for coming-of-age and the adolescent fear of transporting to a new place, enhanced by Chihiro's clumsiness and lingering sorrow. She's not a hero, nor does she ever really become one as she works to flee the realm and reverse her parents' transformation, but the way she steels her resolve and responds to the world around her reflects on a different kind of grounded courage that speaks to a wide range of people. The events that transpire in the bathhouse are utterly hypnotic, a collage of fantastical encounters where it's entirely unknown who or what will slip into the establishment at any given time, or what Chihiro will be required to do to get beyond them. Through the presence of stink spirits, No-Face creatures, and metamorphic dragons, Spirited Away touches on themes built around greed and the deception of appearances, steering the audience through a relatively small-scale and strikingly-illustrated philosophical journey. A constant, satisfying fusion of humor and oddity guides Chihiro through this personal adventure, yet it's not made entirely clear how personal it is until the young girl arrives at its end, armed with everything she's learned in her time in the spirit realm. With the glimmer of a purple hair tie and a look of disbelieving uncertainty on her face, Miyazaki lets a bittersweet sensation hang in the air during those moments where the audience builds their outlooks, an experience which continues to leave me in awe after this capricious masterwork stops casting its spells. 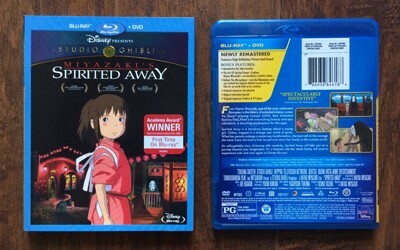 Spirited Away materializes onto Blu-ray from Walt Disney Home Entertainment in what's become the company's regular packaging: a standard dual-disc case offers the Blu-ray disc and the reused DVD presentation from the 2005 set as Disc Two, with the Blu-ray sporting blue accents for some differentiation from the other, similarly-designed disc. A fine cardboard slipcase implements a few raised letters, though less ornate than their previous releases, which replicates the front and back artwork and continues the line of golden spines. Disney Movie Rewards slips have been tossed in, too; no digital copy arrives with the Blu-ray. Well, this is where we've ultimately arrived with Disney's Studio Ghibli line of Blu-ray releases over the years, finally landing on one of their utmost anticipated reissues. Spearheading their latest batch that brings the count to fifteen efforts in which to refine their practices, Spirited Away arrives in a 1.85:1-framed, 1080p AVC treatment ... and, to be frank, it's going to sound like a whole lot of hyperbole if I ramble on about its beauty for too long. Taking into consideration the production time before its release, the artwork on display here has about fifteen years under its belt, and it sincerely appears as if it were illustrated last week. Black lines of the character models are sharp and convincing without any digital distortion, while the lovingly painted backdrops convey their effortless beauty through elegant fine details and brilliant shade gradations. The color palette lands on ridiculously vivid yet entirely natural shades, sporting none of the tint issues that plagued the standard-definition releases while devotedly spreading across the entire prismatic gradient: the gold tint of pillars, the seafoam green of herbal water, the striking reds and oranges of burning embers, the deep blues of expansive skies and bodies of water. Contrast levels are magnificent and leave every nuance of detail, even in difficult dim sequence and around the soot workers, entirely visible. No distortion, no color blocking, nothing but pure beauty that manages to exceed expectations, even after their other recent releases. Bravo. Here's a welcome surprise: both the Japanese and English-dubbed 5.1 DTS-HD Master Audio tracks -- each of which are, for all intents and purposes, flawless -- also send some matrix activity to the center-rear channels, essentially making this a 6.1 sound treatment. Granted, there's only a modicum of activity there, but it still enriches the surround atmosphere in a handful of scenarios. Now, to the bread and butter of the track: separation across the front channels is immaculate, from the rattle of a car on a stone road to the thumps of bare feet on wood and the rush of water into a hot tub. The lower-frequency channel delivers impressive thump wherever it's necessary, credibly supporting those sound effects with natural bass response. Subtle sound effects -- the rumble of steam, falling rain, the shuffle of soot workers, gold pieces dropping on the floor -- offer nuanced and resonant aural details that support the desired atmosphere. And the music's presence remains crystal clear yet wholly aware of the sound element it's coexisting with, never drowning them out. From start to finish, this Blu-ray is a demo-worthy work of brilliance. 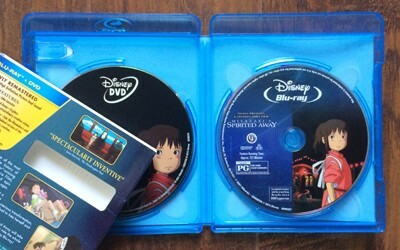 Finally, the subtitles, a sore issue with some of Disney's Ghibli Blu-ray presentations. Similar to some of the other recent Blu-ray releases, two subtitle tracks have been offered here: a standard English track and an English SDH track. It's never mentioned anywhere on the packaging, but these are two entirely different subtitle presentations. The English SDH option mirrors the English dub word for word, which all points considered isn't a terrible dubtitle translation in terms of replicating intent, though it misses some nuance and adds embellishments of its own. Thankfully, there's the other standard English subtitle translation, which differs throughout from the dub as a faithful/literal translation that sneaked in there. The grammatically-sound white text hovers as reputable points on the image at all times, shifting to the top once or twice so as not to encroach on the artwork's details. In short, no areas for complaint here. As to be expected, the extras are the only area where there a little something to be desired of Disney, as they've only carried over the supplements from the previous 2005 DVD release without anything further. The Art of Spirited Away (15:12, 4x3) ends up being a standard, Disney-slanted EPK featurette comprised of interviews, recording-booth shots, and scenes from the film. There's an awful lot of discussion about the plot of the film but there are chunks -- especially featuring director Miyazaki himself -- that elucidate important features of the film. Behind the Microphone (5:42, 4x3) goes exactly in the direction that it sounds, plopping the actors responsible for the English dub in front of the camera to discuss Miyazaki's work and the difference between physical acting and vocal acting. The most substantive feature ends up being the Japanese language Nippon Television Special (41:53, 4x3) on the making of the film, which retraces many of the notable points covered in the previous featurette but with more elaboration and conceptual artwork (notably watercolors). 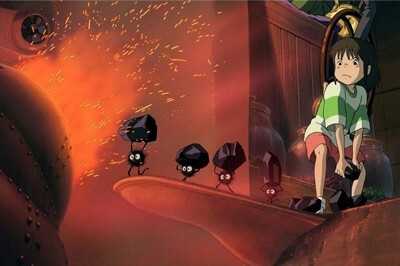 Disney have also included the Original Japanese Storyboards (which look tremendous in high-definition) that cover the entirety of Spirited Away, viewable in Japanese with English subtitles, as well as an Introduction by John Lasseter (1:09, 4x3) and a series of Original Japanese Trailers (18:26, 169 HD) and TV Spots (3.57, 4x3 Letterbox). Disney have also included the mostly bare-bones Disc One from the DVD Copy of the film released in 2005. All of Hayao Miyazaki's films tend to have something distinctive that makes revisiting each one gratifying, whether it's the visceral energy and environmental allegory of Princess Mononoke or the sheer, whimsical joy bottled up in My Neighbor Totoro. 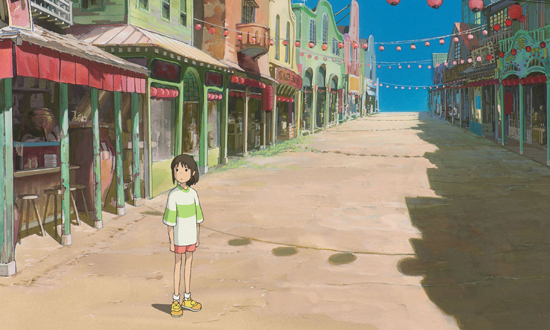 For Spirited Away, it's a little trickier to pen down exactly what that something is between the eerie mystical atmosphere and the evocative coming-of-age fable, or whether it's the fact that both of those elements fluently coexist and complement each other. That's largely because it's such a versatile, spellbinding piece of work that continues to offer fresh delights within each viewing of Chihiro's bittersweet journey through the bathhouse of the spirit realm, packed with breathtaking artistry, compelling characters, and stunning dreamlike imagery. Disney's Blu-ray is, in a word, spectacular, boasting flawless audiovisual properties and carrying over the reputable, if stale, collection of special features from the previous presentation. This one's an easy entry into DVDTalk's Collector Series.